With large silvery foliage Sinningia leucotricha (syn. Rechsteineria leucotricha) and more commonly known as Brazilian Edelweiss makes an excellent houseplant. 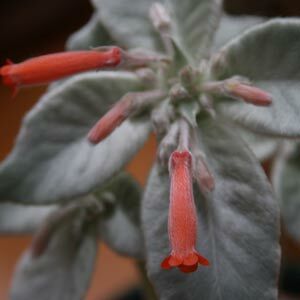 The foliage is covered with a layer of silvery white hairs or indumentum that give if soft velvety look. It grow naturally on rocky cliff faces in fertile pockets. Here it gets good moisture and good drainage. Over time the plant will form a woody caudex, and this is one of the features that makes it a good houseplant. 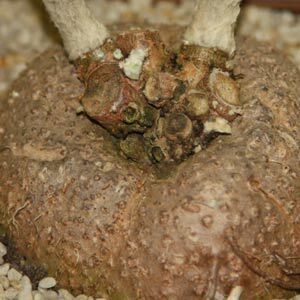 The caudex stores moisture and makes the plant more tolerant of neglect. Not that anyone neglects plants deliberately, however it happens. With a little care, individual leaves will last for 18 months or more,new growth naturally appearing before the older foliage drops. Flowers are and orange colour, tubular and appearing as terminal clusters above the foliage. Some specimens are seen with flowers close to red on colour, however most are orange. This is a succulent plant and does have a period of active growth and a period of dormancy. This growth habit determine watering and care. Use a shallow, rather than deep pot, this assist with preventing water logging of indoor plants. Water lightly when in active growth. As the plant enters dormancy in winter, cut back on watering. Just enough to stop the soil from drying completely. Use water that has been allowed to sit over night. This helps any chlorine to dissipater and also allows the chill to come off the water. Sinningia leucotricha does come from warm climates. Temperature needs to warm, and plants should not be placed in cold drafts. Good strong filtered light, however no exposure to direct sunlight. You can tidy up by removing the spent flower heads if you like. Propagation is usually from seeds or very occasionally from cuttings by means of removing and pups, or root offsets that may appear. Seed germination is by the usual methods. Light covering of Propagation mix to keep seeds in place and only just covered. Spay to keep moist on a regular basis.